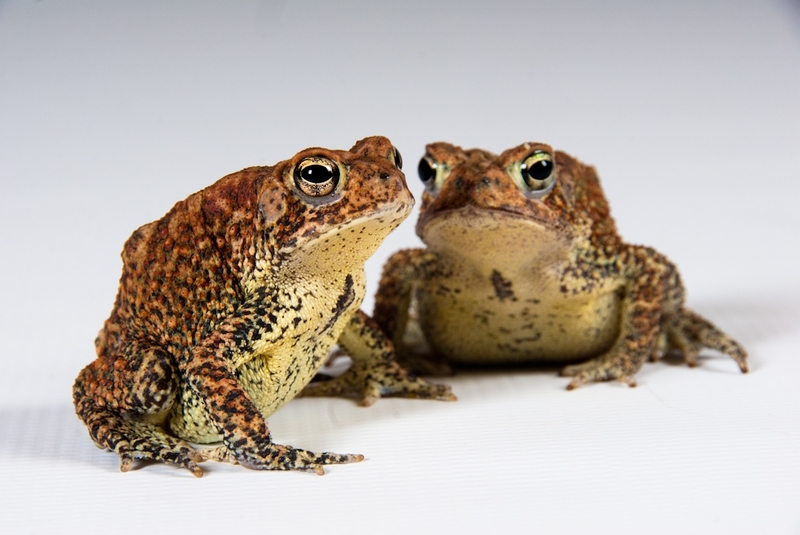 Houston Toads, or Bufo houstonensis. Courtesy of Panama Amphibian Rescue & Conservation Project. Image available on the Internet and included in accordance with Title 17 U.S.C. Section 107. Houston Toads at an artificial pond for breeding. Courtesy of The Houston Toad. Image available on the Internet and included in accordance with Title 17 U.S.C. Section 107. The Houston Toads used to live in 12 counties, and now they are gone from all but four counties. Image available on the Internet and included in accordance with Title 17 U.S.C. Section 107. HOUSTON TOAD. The Houston or Wottring's toad (Bufo houstonensis) is an endangered species adapted to only seven counties in Southeast Texas. It is a moderate-sized (two to three inches in length when adult) brown to reddish-brown toad, most closely related to the more northerly distributed American toad. Sandy areas forested in pine, such as those found in Bastrop State Park, appear to be particularly favorable habitats. The toad spends daylight hours and very cold weather buried in the soil. Its breeding season ranges from mid-January through mid-May; early breeding may be independent of rainfall and appears to be initiated by mild winter weather. Males in breeding choruses give long, trilled mating calls at night from the edges of ponds and small creeks; the skin of their vocal pouches is translucent and overlies darkly pigmented muscle tissue. Eggs are laid in long, gelatinous strings; their development rate and that of the tadpoles that hatch from them is dependent on water temperature. Hatching occurs in about a week; transformation of tadpoles to adults takes place about two months later. Tadpoles feed upon algae and detritus; insects and other invertebrates form the diet of adults. The skin glands of these and other toads secrete toxins that aid in protection against predators. The species was first described within the city of Houston, but urban encroachment has since destroyed it there. Its restricted distribution and habitat destruction within this area are the major reasons for its inclusion on endangered-species lists. Successful efforts at rearing the species in a laboratory have been undertaken at the Houston Zoological Park, and an endangered species recovery plan has been made. W. Frank Blair, ed., Evolution in the Genus Bufo (Austin: University of Texas Press, 1972). Lauren E. Brown, "The Status of the Near-Extinct Houston Toad (Bufo houstonensis) with Recommendations for Its Conservation," Herpetological Review 6 (June 1975). U.S. Department of the Interior Fish and Wildlife Service, Selected Vertebrate Endangered Species of the Seacoast of the United States-The Houston Toad (Biological Services Program, March 1980). Handbook of Texas Online, Robert F. Martin, "HOUSTON TOAD," accessed April 23, 2019, http://www.tshaonline.org/handbook/online/articles/tgh01. Uploaded on June 15, 2010. Modified on March 29, 2017. Published by the Texas State Historical Association.